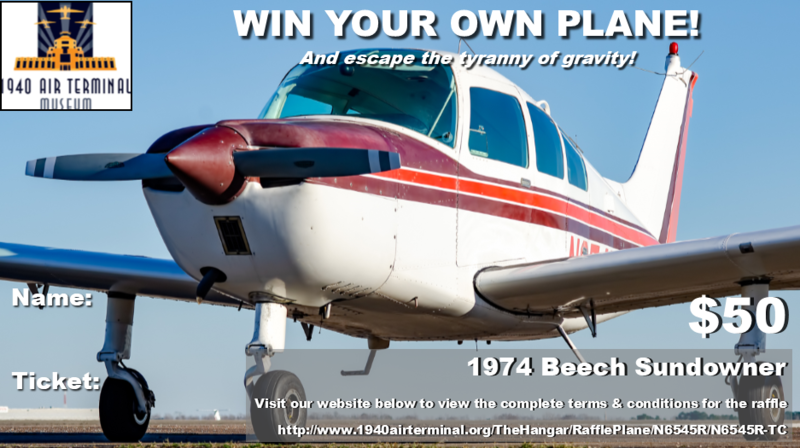 The 1940 Air Terminal Museum is raffling this vintage 1974 Beech Sundowner as a fundraiser. Raffle tickets for the fundraising contest are available for $50 each starting on Monday January 14, 2019, and no more than 2,500 tickets will be sold. The winner will be announced at the museum's December 2019 Wings & Wheels open-house (December 21, 2019), or an earlier Wings & Wheels if all tickets have been sold. The raffle airplane will be on display at the museum's monthly Wings & Wheels open houses, fly-ins, air shows and at popular flying destinations throughout the contest. The 1940 Air Terminal Museum will give away a 1974 Beech Sundowner as a fundraiser. Raffle tickets for the fundraising contest are available for $50 each starting on Monday January 14, 2019, and no more than 2,500 tickets will be sold. The winner will be announced at the museum's December 2019 Wings & Wheels open-house (December 21, 2019), or an earlier Wings & Wheels if all tickets have been sold. The raffle airplane will be on display at the museum's monthly Wings & Wheels open houses, fly-ins, air shows and at popular flying destinations throughout the contest. The Houston Aeronautical Heritage Society, Inc. ("HAHS"), a 501(c)(3) Texas non-profit corporation, begins the twelfth annual 1940 Air Terminal Museum Win-A-Plane Fundraising Raffle on Monday January 14, 2019. HAHS will give away one Beech Sundowner airplane, bearing FAA registration number N6545R ("the airplane"), or a reasonably equivalent airplane, should the airplane be damaged, destroyed or develop mechanical problems which, in HAHS' sole discretion, are not feasible to repair prior to the drawing. HAHS will give the airplane to the holder of a raffle ticket selected randomly by an independent accounting firm. Tickets may be purchased at the 1940 Air Terminal Museum at William P. Hobby Airport in Houston, Texas, at select locations and events, online at our website below, by telephone or mail within the United States, and elsewhere as determined by HAHS throughout the contest period. Ticket buyer represents to HAHS that it is legal to accept the ticket via mail in his or her location. Ticket sales will cease when 2,500 tickets have been sold, or at noon CDT on Friday December 20, 2019, whichever occurs first. The award of the airplane is expressly conditioned upon the holder of the winning ticket executing an acceptance agreement and liability waiver with HAHS and this contest is subject to the terms of such legal instruments. A copy of same is available from HAHS for review throughout the contest period, but is subject to revision until the drawing. The award of the airplane is expressly conditioned on compliance with all applicable laws, including the collection of federal income tax withholding based upon the value of the airplane at the time of transfer for remittance to the IRS. Should the winner decline to accept the airplane, or if the winner cannot be located through the contact information provided on the winning raffle ticket, another ticket will be selected randomly by an independent accounting firm until a winning ticket holder accepts and takes possession of the airplane. The winning ticket holder does not need to be present to win; however, confirmation of the winner's identification will be required to claim the prize. The value of the airplane is $31,000. All tax consequences of accepting the airplane are the sole responsibility of the winner. The airplane will be transferred to the winner during the January 2020 Wings & Wheels open house at Hobby Airport in Houston, Texas, following the winner's acceptance of the airplane.HAHS reserves the right to use the winner's name and likeness in publicity and marketing materials, including but not limited to, media releases, HAHS' website, brochures and newsletters. All proceeds from the contest go to HAHS and will be used for the expenses of the contest (including purchase and ownership expenses for the airplane) and operating expenses of the 1940 Air Terminal Museum. VOID WHERE PROHIBITED.